Is it possible that the man who ran the longest presidential campaign in history is already looking to extend the record? If so, 2012 can’t arrive soon enough. Ever Heard of the American Constitution Party? If former GOP House Rep. Tom Tancredo can overcome his current 5 point gap to become Colorado’s next governor, we’ll all need to brush up on the principles and policy preferences of his new political home: the American Constitution Party. As would be imagined, the ACP is in-line with Tancredo’s stance on border security, and regulating the number of immigrants. The party also seemingly provides a home for Christian libertarians. If Tancredo pulls off the biggest surprise of the 2010 midterm elections it will be fascinating to see whether the ACP can get any of its platform through Colorado’s soon-to-be Republican legislature. Oh, the sub-plots this election cycle! In an interview with the Wall Street Journal’s John Fund, retiring Rep. Brian Baird (D-WA) shares some thoughtful insights about what went wrong for Democrats the last two years. From appallingly bad advice from so-called strategists (e.g. “voters don’t care about deficits”) to an “authoritarian” leadership that demanded blind loyalty from members, Baird’s interview could be read as a warning to the incoming Republican majority. Common sense in rules and policy is a non-partisan winner. Too bad Baird won’t be around to make that case inside Congress. Wondering what some liberal icons will be wearing this Halloween? CFIF’s Renee Giachino presents you with a speculative guide on what House Speaker Nancy Pelosi, Senate Majority Leader Harry Reid, Vice President Joe Biden and others with be posing as this October 31. A group calling itself the “Progressive Change Campaign Committee,” which sounds so 2008 and even employs the same font and shade of blue as Obama’s “Organizing for America” page, is attempting to portray a false consensus in favor of new federal Internet regulation. The group trumpets its success in getting 95 Democratic House and Senate candidates to sign a pledge favoring Internet regulation via so-called “Net Neutrality.” But notice an interesting thing about those 95 candidates. Namely, not a single one is in a race labeled “Solid Democrat,” “Likely Democrat” or even “Lean Democrat” by the Cook Political Report. Not one. Of the 95, 79 are in races labeled “Solid Republican,” with 11 in either “Likely Republican” or “Lean Republican,” and only five in races even labeled “Toss Up” by Cook. In other words, this pledge is a “Hail Mary” by desperate candidates and Internet regulation advocates. It also reflects the fact that significant majorities of Americans surveyed oppose new Internet regulation by the federal government. The last thing the Internet needs right now is for the federal government to turn it into the tech version of ObamaCare, and voters shouldn’t be deceived by this sort of silly season antic. In an op-ed published today on The Hill’s Congress Blog, CFIF Vice President Timothy Lee warns that “regardless of what occurs on November 2,” the EPA’s regulatory agenda moving forward threatens to hit consumers and business hard and right where it hurts: their pocketbooks. When we ring in the New Year in just two short months, next week’s elections will be in our collective rear view mirror. However — regardless of what occurs on Nov. 2 — the U.S. Environmental Protection Agency’s (EPA’s) campaign to impose its new round of economy-wide environmental regulations will continue in 2011. That should worry every American, because EPA’s wish list will hit consumers and business where it hurts: their pocketbooks. Supported by an administration that has suffered defeat after defeat on Capitol Hill in its attempt to pass wholesale climate change legislation, EPA instead seeks to impose its costly and burdensome regulatory agenda through the back door. 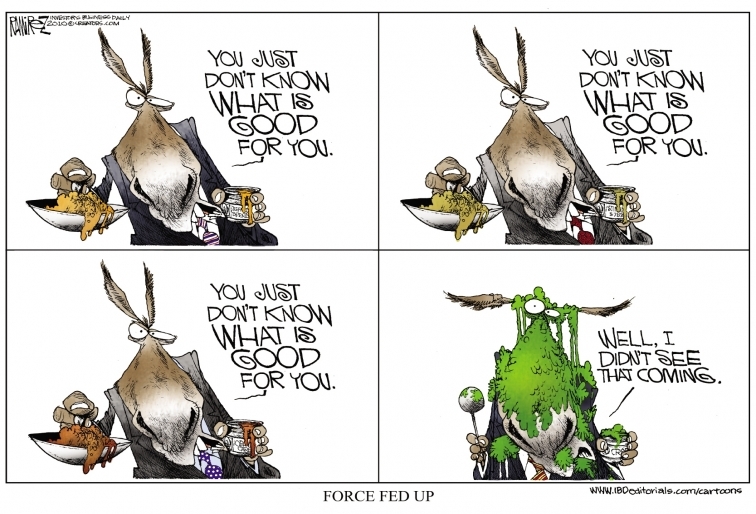 From overly complex new greenhouse gas rules to more stringent ozone standards to new mandates for recycled coal ash, unelected EPA bureaucrats hope to decree through regulatory fiat what they can’t enact through the democratic or legislative processes. Power abhors a vacuum. So too do the people seeking it. From Rhode Island comes another example of the chit-building Bill Clinton is possibly doing while President Barack Obama dithers. You may recall the now-infamous “shove-it” line to President Obama came from the Democratic nominee for Rhode Island’s governorship. It was presaged by the president’s refusal to endorse Democrat Frank Caprio in deference to Obama’s friendship with former Republican, current independent candidate Lincoln Chafee. In his rebuke of the president, Caprio did more than reject Obama’s aura; he embraced Bill Clinton’s. Despite the furor his crude suggestion caused, Mr. Caprio not only is sticking by his “shove it” comment. His campaign has just announced a weekend event with Mr. Clinton, whom it says is much more popular in the state than Mr. Obama. The campaign told Politico.com that Mr. Caprio “aims to be a governor in the mold of President Clinton.” Zing, zing. It also noted a Gallup survey showing that voters of every affiliation would be more likely to vote for a candidate backed by Mr. Clinton than one backed by Mr. Obama. A new poll by the local NBC affiliate suggests that “shove it” may have unsettled the race, with Mr. Chafee now running at 35% and Mr. Caprio, with 25%, running third behind Republican John Robitaille, who has 28%. How much confidence to put in such polling amid a fluid three-man contest is debatable. In any case, Democrats will be watching closely. An eleventh-hour victory by Mr. Caprio would be fodder for those dreaming of a Clinton-Obama rematch in 2012. If Caprio wins, don’t expect a make-up session between him and the president. If he loses, don’t be surprised if he emerges 18 months from now as a top hand in Hillary’s bid to challenge for the 2012 nomination. Today, the U.S. Commerce Department reported disappointing 2.0% gross domestic product (GDP) growth for the third quarter of 2010. Not only is that number below the expected 2.2% rate, it’s also below the rate needed to substantively reduce our 9.6% unemployment rate. This now means that GDP growth rates for the five quarters of our current “recovery” have been 1.6%, 5.0%, 3.7%, 1.7% and now 2.0%. Here’s how that compares to the Reagan recovery, which focused instead on cutting taxes and reducing government regulation. In the five quarters following implementation of the Reagan tax cuts in January 1983, we posted remarkable growth rates of 5.1%, 9.3%, 8.1%, 8.5% and 8.0%. So remind us again: Who is the one blinded to “facts and science,” Mr. President? 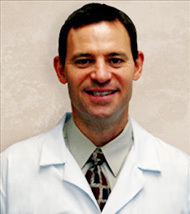 Interview with Dr. Scott Barbour, a board certified orthopaedic surgeon and member of the Board of Directors of Docs4PatientCare, on voter backlash against ObamaCare and the importance of repealing it before the doctor-patient relationship is ruined forever. Kaine goes on to list legislation requiring equal pay for women and a taxpayer bailout of the auto industry as accomplishments that will resonate in “the reddest districts in America…” If that’s the best the man in charge of Democratic fundraising can do to off-set the anger caused by ObamaCare, the Recovery Act and trillions in deficit spending it’s no wonder the politicians who actually have to face voters next Tuesday are throwing the liberal establishment under the bus. They’d be nuts to do otherwise. Consistent with his vision of himself as point guard directing the entire universe, Barack Obama has repeatedly scolded his German counterpart Angela Merkel to pursue more of the Keynesian “stimulus” he prefers. Today, however, employment data provided the latest vindication of Germany’s rejection of Obamanomics. Despite the worldwide economic malaise, German unemployment has now fallen to its lowest level in almost 20 years. Its unemployment rate is now 7.5%, and its total number of jobless fell below the 3 million threshold for the first time since 1992. Here in the U.S., meanwhile, we’ve now seen the unemployment rate rise from 8.2% when Obama signed his $814 billion “stimulus” in February 2009 to 9.6% today. Obama loves to lecture campaign crowds that those opposing his agenda are blind to “facts and science,” but this latest data once again proves that he’s the one refusing to acknowledge hard reality. Which of these sounds like the person currently serving as the leader of his party and nation’s chief executive? On one side is a man crisscrossing the nation in a mad-dash to raise his members’ hopes, and squeeze out a few more votes and volunteers by Election Day. He is upbeat, full of self-effacing humor, and mindful of long-term perspective. The other man is in a television studio in Washington, D.C. defending the results of a campaign that ended almost two years ago. To a comedian. And failing. The first man is former president Bill Clinton. The latter is his current successor Barack Obama. 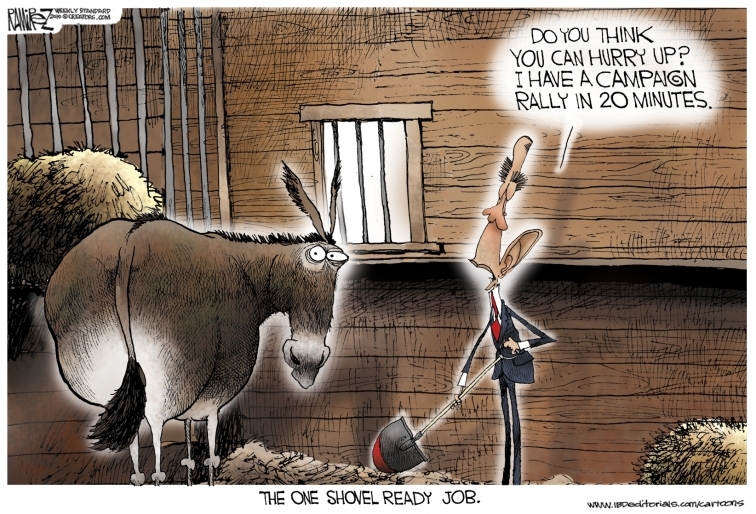 While Clinton is preaching a “we’re-all-in-this-together” sermon in battleground states, Obama seems lost in self-absorption, unable to feel anyone’s pain – including the crushing news that one’s political career is over because of votes the president asked you to take. Sure, politics is a big-boy business with harsh outcomes. But it is jolting to watch President #44 missing so many lessons from #42 about the importance of running through the finish line instead of stopping several yards out. Just like winning, sometimes people need to feel like they’re losing for something; in this case the president’s uber-liberal agenda. The failure to lead and inspire in the face of certain defeat will not be forgotten by those Democrats who survive to fight in 2012. Chance are, the memories of Clinton helping and Obama not will do much to make Hillary Clinton’s dark horse candidacy all the more appealing. No sooner had Obama publicly beheaded McChrystal that Wednesday than a fresh catastrophe crossed Gibbs’s desk: An undersea robotic vehicle in the Gulf had dislodged the containment cap on the BP well. Until the lid was reattached eleven hours later, a new torrent of oil spilled into the sea. Gibbs went back into the Oval to give Obama the news. The president stared at Gibbs, stunned. “Well, why did it do that?” he demanded. Come again? Would that be the President of the United States telling his Press Secretary to take the lead on a underwater engineering project so complex that it befuddled the President’s Nobel laureate Secretary of Energy? What was Gibbs supposed to do? Draft an aggressive press release prohibiting any further disasters? We know this is the man who promised to stem the ocean’s rising tides, but perhaps Obama was taking the whole King Canute shtick a little too seriously. Pity Rory Reid. The son of U.S. Senate Majority Leader Harry Reid (D-NV), Rory is the luckless family scion getting blown out in his race for Nevada governor. The newest Rasmussen Reports poll finds the younger Reid down 20 points to former federal judge Brian Sandoval. Maybe Rory should have built up more chips with organized labor like his dear old dad. According to multiple reports, the elder Reid is enjoying all kinds of “thanks-for-the-memories” tributes such as gift cards and free food for pro-Reid votes. If Senator Reid hangs onto his seat, his son should remember that liberal success comes from union largesse. Jay Cost at The Weekly Standard makes a compelling case that one of the reasons a Republican victory next Tuesday may seem ho-hum is that its arrival has been trumpeted for so long. After months of voter resentment over ObamaCare, the Recovery Act, and spiraling unemployment the notion that the GOP might surpass 1994’s gains can seem pedestrian. Cost reminds us it isn’t. In fact, the intensity and location of voter resentment towards the liberal status quo could portend a possible realignment in states President Barack Obama won in 2008 to the GOP column. The circumstantial evidence in favor of this? As Jim Geraghty’s Obi Wan noted yesterday, it’s all around us. We simply have gotten used to it. Ohio is all but gone for the Democrats, including the swingiest of swing districts in Columbus. Michigan is a lost cause. So is liberal icon Russ Feingold in Wisconsin. Pennsylvania looks like it will go maybe +4-6 for Toomey and Corbett. All of these places voted for Obama, and all of them are basically gone. Weak Republican candidates in Colorado and Nevada keep those races tight, but otherwise the toss-ups are: California, Illinois, West Virginia, and Washington. The last Republican presidential candidate to win all four of these? Ronald Reagan in 1984. Whoever earns the GOP presidential nomination for 2012 will have the wind at their back and a groundswell of proven precinct walkers at the ready. We’ll see if the candidate can figure out how to use them. Ninety percent? Wait a minute… Doesn’t every dizzy big-government leftist from Barack Obama to Paul Krugman tell us that “deregulation” of the housing sector caused our economic difficulties? The fact is that the housing finance market is one of the most regulated, not least regulated, sectors of the entire economy. Thanks to Professor Jaffee, we are reminded of the sheer scale of that regulation, as well as the left’s efforts that fed the housing bubble. As we ramp up to the midterm elections with liberals claiming that the threat of Iran is overstated, that all we need to accomplish peace in the Middle East is for Israelis to stop building condos, that terrorism is better defined as “man-caused disasters”, and that Afghanistan can be won with a publicly-defined date for withdrawal, it’s worth remembering a time when Democrats produced some of the fiercest of our cold warriors. Oh, for just one more national Democrat (Joe Lieberman doesn’t count) like this.